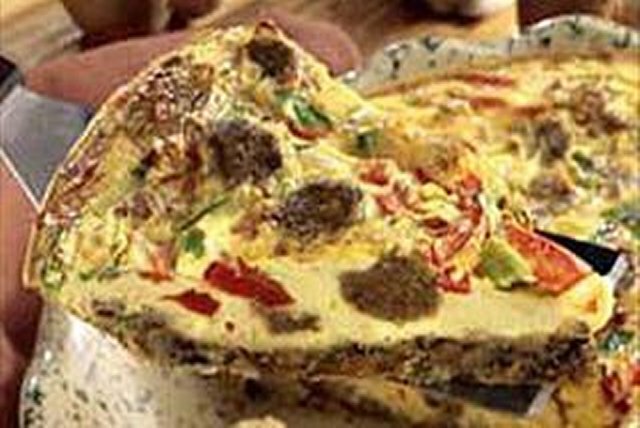 Mushrooms, bell peppers, green onions…this BOCA Morning Bake has got it all! And it's got it in a recipe that serves six in just 30 minutes. Melt margarine in large nonstick skillet on medium-high heat. Add mushrooms; cook and stir 8 min. or until liquid is evaporated. Remove from heat. Stir in bread crumbs. Press mushroom mixture onto bottom of 9-inch pie plate sprayed with cooking spray. Combine remaining ingredients; pour over crust. Bake 20 min. or until center is set. Double all ingredients. Mix crust ingredients as directed; press onto bottom of 13x9-inch baking dish. Top with prepared filling. Bake at 350°F for 25 to 30 min. or until filling is set in center. Makes 12 servings. Substitute 4 beaten eggs for the egg product. Use a food processor to finely chop the mushrooms.